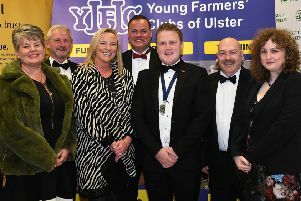 The fifth annual Young Farmers’ golf day turned out to be the most successful yet with a total of 38 golfers enjoying a round at Ballyclare Golf Club, one of the best parkland courses in Co Antrim. Indeed, demand out stripped the allotted numbers and several members were left disappointed. Despite a couple of fairly heavy showers and a slow pace the spirits were undaunted and the general consensus was that a good day was had by all. The event is always reliant on sponsors and this year organisers were indebted to The Grassmen for sponsoring the winners prize. In addition, Sky Sports provided prizes for the next five places, thanks to Sky F1 reporter and former member William Esler for organising these. This year the YFCU had three visitors and William Kennedy kindly sponsored these prizes. Ballyclare Golf Club kindly donated two four ball vouchers for the longest drive and closest pin competition and thanks goes to Colin Lyttle professional at Ballyclare for these and his help in making the day such a success. Visitors: First - Angus Robson, second – Richard Allen and third – Edgar Allen. Bob Esler congratulated the winners and thanked all the members past and present for attending in such numbers. He asked for suggestions for a venue for next year and complimented Ballyclare for their hospitality and condition of the course. Finally he thanked the sponsors and Lynda Esler for all her assistance as starter and scorer on the day.